No matter ones creed, belief - or placement in time and space – it is always good to take regular times to pause and recapitulate. If this is not an ongoing process, at least the turning of the year is a good occasion to do so. It doesn’t matter that the New Year actually begins with the entering of Aries in the sign of the Sun or with Capricorns entering in the Sun – both the Ram and the Goat signals something worthy of contemplation. Yet other cultures count the solstices as markers of renewal. They are both animal signs heralding new beginnings. Heralding the new should bring a death to the old. Parts of the old should be transmuted, other parts taken as lessons so we can count our blessings. 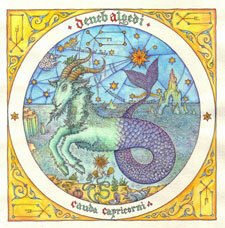 The Western New Year falls anyhow within the perimeters of the rays of the fixed star Deneb Algedi, the tail of Capricorn. Cauda Capricorni is one of the fifteen fixed stars and is evoked by the scent of marjoram. If the moon is favorable it gives victory in disputes and safety of home. Its starry sigil gives us the idea of the saltire or St. Andrew’s cross providing a key for an enclosure that can be a home or a coffin. The key to coffin or home is a good imagery for the constant contemplation, and as the year turns it is good to contemplate what doors we seek to open and which we seek to shut. Deneb Algedi is the true ‘wishing star’. When we at the fireworks of the New Year bring oath and solemn promises, hopes and declarations – it is all under the auspices of this star that binds what you seek to bind and what opens what you seek to open – that you raise your glass and welcome the New. It doesn’t matter your creed, belief - or place – the spirit of home and renewal embodied in welcoming the New is something good in itself. We can say farewell to trespassing and failures and we can welcome their lessons. We can use these lessons to build our path onwards or we can retreat and gain the key to the coffin. As the New blazes, the Fates give back their thread and key, and so imprints can be made. And it is in this moment we become Fates’ master. The saltire, the Cross of Andrews martyrdom gives cause for pause. He asked to be martyred on this cross that stretches towards the mid-quarters, not finding himself worthy of the pole, the axis. But it was also about recognizing that death and its own mystery that supports life in all directions, a pulse and a breath. Life as death makes part of living in so many levels. Life is a continuum of death – and death is nothing but a chain of transmutations – all is kept, and nothing is lost as we make our path and face our challenges. These are moments where we open the vaults of coffin and home. So, what will you do with the key to your own Fate, will you unlock coffin or home? Renewal is a chance to clear the weed and bring the blessings of the past forward. It is an opportunity to burn bridges and let go of deeds and people that impair the path of abundance. It is a time for giving the bad and malevolent to the coffin so the beautiful and loving can resurrect as a compass on the path. It is a time for us to give honor to the undying Sun and the earth we walk, because if it was not for Her we would not be, if it was not for He, we would not be. We need to gather together in harmony, because as earth supports our steps in life, so does our blessed friends in this human journey. Our friends, the quiet ones or the loud ones, our friends, being in flesh or air – it is all about the gathering of abundance, that marks the path of prosperity and breakthrough. So, let us gather together in harmony, let our wishes bring death to what have been bad and also the gift of wisdom to take the lesson from the passing year, so we can be crowned with blessings as we forge the path onward! And let us do it in the spirit of Ifá or in the spirit of Lawrence Ferlinghetti – but let us gather in harmony.